The Second Biennial brought together 850 participants, 300 Chinese and 550 Europeans. Nearly 20 main socio-professional categories of players, including religious leaders, businessmen, representatives of the non-for-profit world and of the academic world, were represented. The innovative format of the 2007 meeting guaranteed freedom of tone and generated a new spirit. 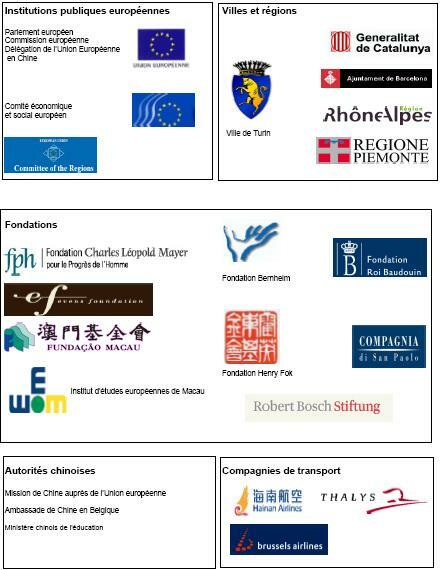 The workshops, with 14 Europeans and 5 Chinese on average, were designed to comprise four sessions, allowing Chinese, then European participants to give a dynamic presentation of the transformations at work in their respective societies, to identify convergences and differences as well as the means to cope with them, together and in a responsible way. Participants agreed that this discussion format allowed true discovery and understanding of respective realities, ranging from access to the Internet in China to the role of universities in Europe, as well as a positive deconstruction of the image of others, and even swept away the idea that there was a European point of view on the one hand, and a Chinese point of view on the other. The 2007 Biennial Meeting was officially recognised by the European and Chinese authorities. It was supported by Mr José Manuel Barroso, President of the European Commission and Mr Hans-Gert Pöttering, President of the European Parliament, and, during the plenary sessions in Brussels, there was contribution from all the major European institutions — Commission, Parliament, European Council, European Economic and Social Committee, Committee of the Regions — as well as from the Chinese authorities — Mr Guan Chengyuan, Ambassador Extraordinary and Plenipotentiary Head of Mission of the People’s Republic of China to the European Union and Ms Zhang Qiyue, Ambassador of the People’s Republic of China to Belgium. the list of participants at the 2007 Biennial Meeting workshops (PDF, 309 Kos). the list of the key players of the workshops (PDF, 75 Ko).